A crucial greenway link between Railroad Park and Sloss Furnaces could become a centerpiece project in the Rotary Club of Birmingham's celebration of its 100th anniversary. 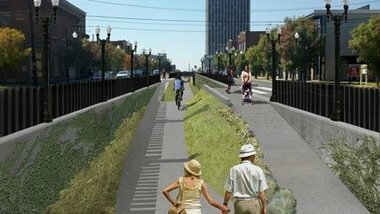 The club, which recently became the world's largest Rotary club, is exploring a partnership with the city of Birmingham, Freshwater Land Trust, Operation New Birmingham and Railroad Park Foundation to convert into a pedestrian and bicycle greenway the abandoned railroad line that runs along First Avenue South under the viaducts between 20th Street and 24th Streets. The working name for the project is "Line Park." Making the connection would be a major advance in the long-term goal of creating a sprawling linear park connecting attractions such as the new baseball park with the office and entertainment district in the Lakeview area.